With Table Mountain lying within the city’s boundaries, the Park stretches all the way southward down the Peninsula to Cape Point. This situation makes Cape Town the perfect base from where to explore the region. 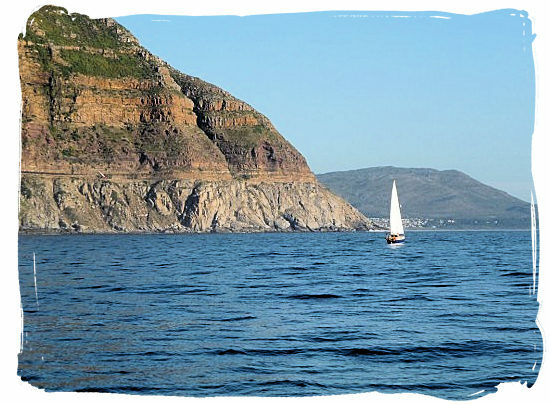 On the Cape Peninsula the call of the sea is only a few kilometres away in any direction. So if you cannot resist the urge to go on a boat or yacht trip to view the Cape coastline from a different perspective, a choice of boat charter operators are ready to meet all your needs. They offer a wide variety of boat trips, accommodating a wide range of budgets and time frames. For the adrenalin-fired thrill seekers there are the shark cage diving, deep-sea fishing and high-speed ocean adventures to name but a few. For those with a more temperate nature there are the scenic harbour trips and boat and yacht trips along the coastline. A stunning experience, especially on a summer's evening. The flat beaches, soaring mountains, forested slopes and challenging mountain passes offer the impassioned cyclist a wide variety of routes to choose from. 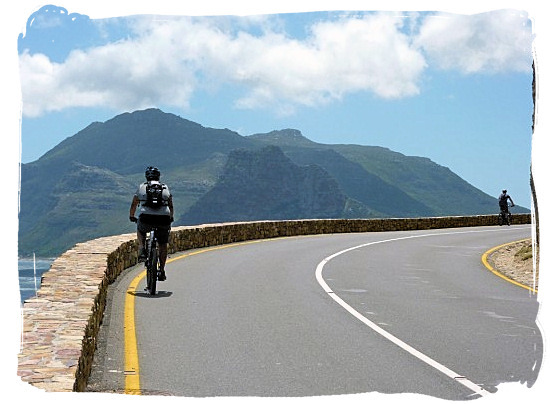 Some of the most favored routes around the Cape Peninsula are the "Ou Kaapse Weg", Camps Bay to Hout Bay and Chapman's Peak Drive. 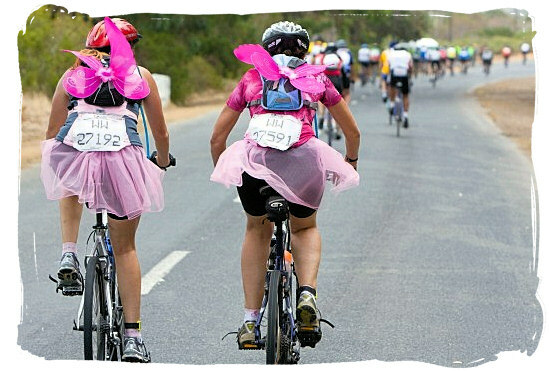 Cape Town is host to a number of prestigious cycle races every year. The stunning views of False Bay and the thick forest terrain will attract many mountain bikers to the extraordinary beauty and shaded tracks of the Tokai Forest, one of the top mountain biking regions of South Africa. The route starts at the Tokai Arboretum on the slopes of Constantia berg, offering a selection of long and short tracks ranging from easy to really challenging. 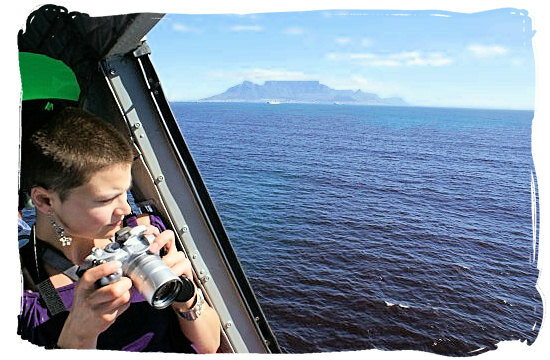 Treat yourself to the most awe-inspiring views of Cape Town and the Cape Peninsula soaring in a helicopter above its sparkling ocean, sun-drenched beaches and majestic mountain ranges. Top it off with a romantic fly-in lunch on one of the great wine farms. 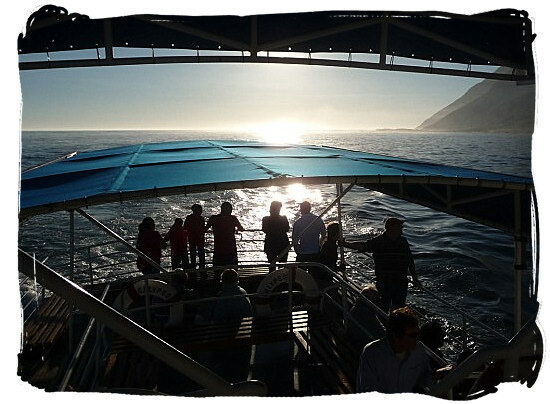 It is one of the most unforgettable ways to experience the Cape. There are a wide variety of flights to choose from in terms of flying time and areas covered, to suit your budget. Depending on your choice you can fly over Cape Town and the Waterfront, Constantia Valley, Muizenberg, Seal Island, Fish Hoek, Noordhoek, Hot Bay, Llandudno, Table Mountain, Cape Point and many other places. 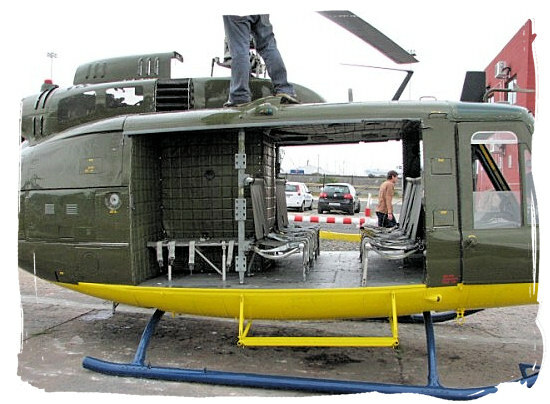 One of the legendary Bell UH-1 Huey helicopters of Cape Town Huey Helicopter Flights. 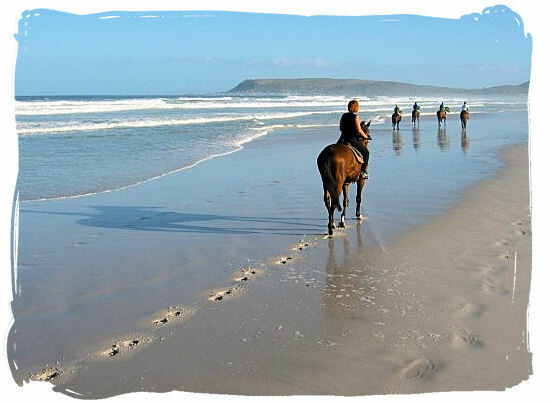 For those who enjoy horse riding, picture yourself on horseback, galloping away along the water’s edge on one of the sun flooded Cape Peninsula beaches, with the wind blowing through you hair. 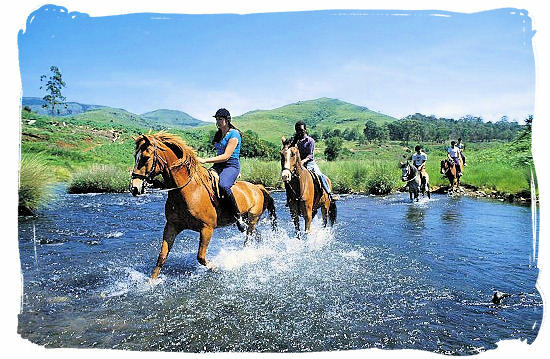 On the Peninsula you will find a wide range of horse riding activities on offer, catering for all ages and levels of experience. Enjoying nature at its best from the back of a horse. There are a several excellent horse riding stables and tour operators who can offer you a complete package, including experienced guides and well-behaved horses, to guarantee a wonderful experience. To make the most of enjoying the serenity and beauty of the spectacular scenery, groups are normally limited to a maximum of six riders and a guide. There's nothing quite like horse riding on the beach with the wind in your hair. Hiking is one of the most popular ways to enjoy the scenery and all the other facets of the Table Mountain National Park and of the mountain itself. 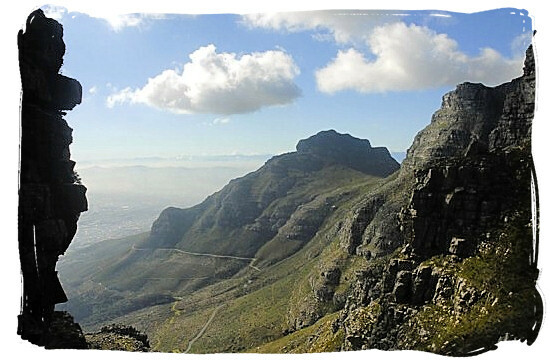 You can take your pick from a very large range of walks and hiking trails on and around Table Mountain. 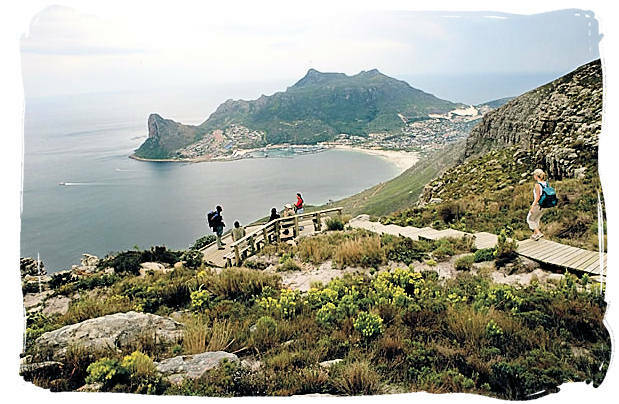 View of Houtbay, hiking in the Cape Peninsula is a truly rewarding experience. Two top choices are the Platteklip Gorge trail (one day) and the four Hoerikwaggo trails (two to six days), the People's Trail, the Table Mountain Trail, the Orangekloof Hiking Trail and the Top to Tip Trail. Hoerikwaggo is a word from the language of the original Khoikhoi people, meaning "Sea Mountain". One of the many beautiful views along Platteklip Gorge hiking trail. 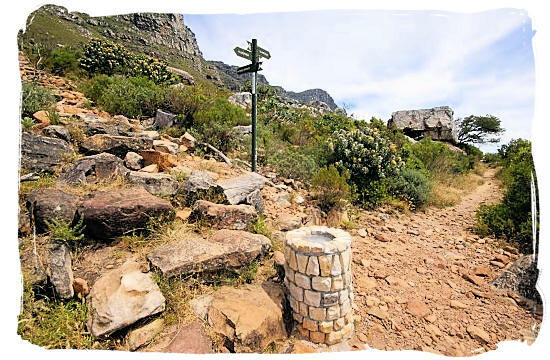 The Platteklip Gorge hiking trail is a short easy-going and straightforward climb to the top of table Mountain. The average time taken is about 2.5 hours, the very fit ones can do it in less then that. 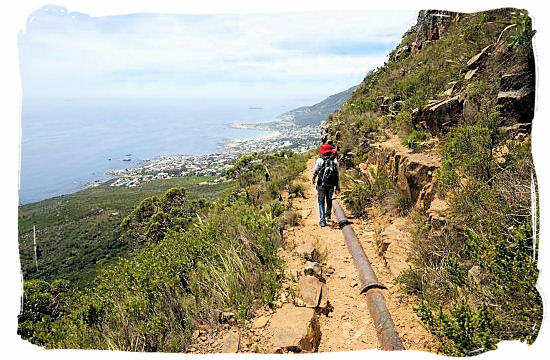 Other popular and enjoyable climbs are the Kasteelspoort trail which runs through a gorge overlooking Camps Bay and the Pipe track which is a fairly level route and therefore popular with the walkers. The four Hoerikwaggo trails are the People's Trail, the Table Mountain Trail, the Orangekloof Hiking Trail and the Top to Tip Trail. They are luxury overnight trails, ranging from two to six days, operated by South African National Parks. For those who like comfort and enjoy to be pampered, there are guides, porters and catering from various tour operators, to accompany you. Just say glorious sunshine, stunning scenery and the most beautiful eye-blinding green fairways and the golfing enthusiast starts smiling all the way. They will find just that in and around the beautiful city of Cape Town, some of the most awesome and panoramic championship-status courses in South Africa. Erinvale in Somerset West is said to be one of the best residential golf courses in South Africa. 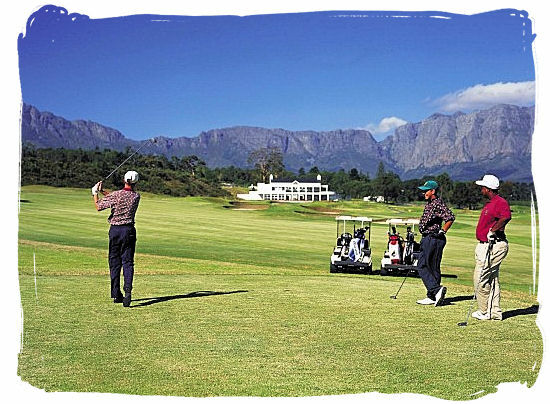 They are top class in terms of quality, layout and setting and in such a variety that the wants and preferences of any golfer visiting the Cape, can be met, irrespective of handicap. Pick one that will fit yours and play a few holes along some of the lushest and most immaculate greens South Africa has to offer. 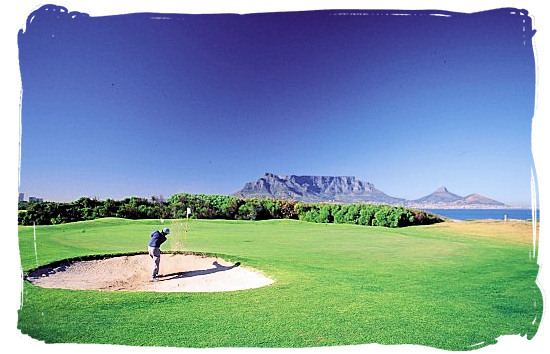 Milnerton Golf Course is a seaside course, nestling between the Atlantic ocean and the Rietvlei river. Great news for the surfing enthusiasts. Around Cape Town and the Cape Peninsula, you will find the highest concentration of great surf spots of the whole of South Africa, within an hour’s drive from wherever you are on the Peninsula. Make friends with the locals, they will gladly share their favourite spots with you. Surfers viewed from Blouberg beach, with Table Mountain as backdrop. For the non-surfers who are harbouring a desire of mastering the art of surfing, your holiday in the cape is the ideal time to change that. 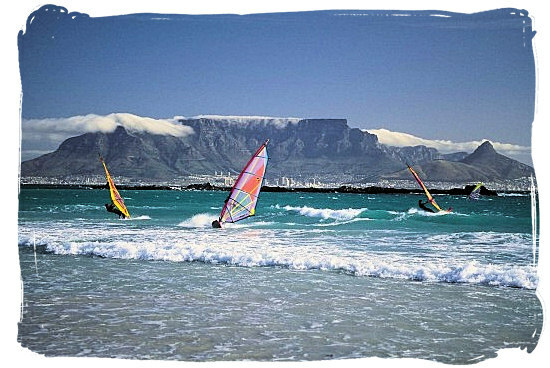 The Cape Peninsula is home to a number of excellent surfing schools. If you want to have a go at it yourself, go to the Muizenberg or Big Bay beach, the conditions there are optimal for learning to surf. Cape Town and the Cape Peninsula offer some of the best surfing waves in the world. The Cape Peninsula is the perfect place to discover the thrills of scuba diving. It is regarded as a top area for training aspirant scuba divers. The extraordinary thing about diving around the Cape Peninsula is that you have two oceans to choose from, the colder Atlantic Ocean to the west and the warmer Indian Ocean to the east and south. 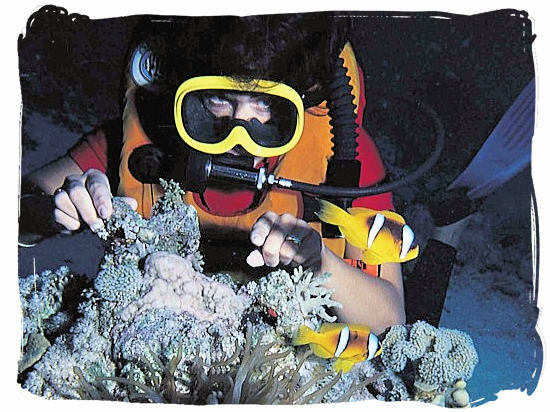 A number of dive operations offer a wide variety dives, including diving courses. For the ultimate diving experience of a lifetime, you should go on a Great White shark cage diving trip, it’s absolutely awesome. 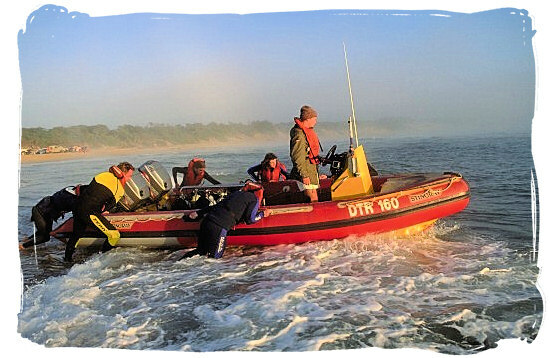 Although False Bay is well known as a popular hunting ground for the Great White, most of the guided shark cage diving trips take place at the coastal town of Gansbaai. One of the prime attractions of the Cape Peninsula are its glorious white sandy beaches set against an azure sky and a crystal ocean. 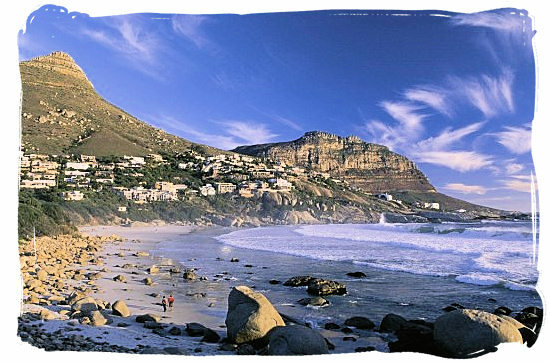 The Cape is proud of its blue-flag beaches: Mnandi Beach, Clifton Beach and Bikini Beach (near Gordons Bay). Blue-flag beaches earn their status due to their facilities, excellent water quality and safety standards. The beaches on the Atlantic ocean side are perfectly suited for lazy, long afternoons and slow evenings coloured by glorious sunsets. 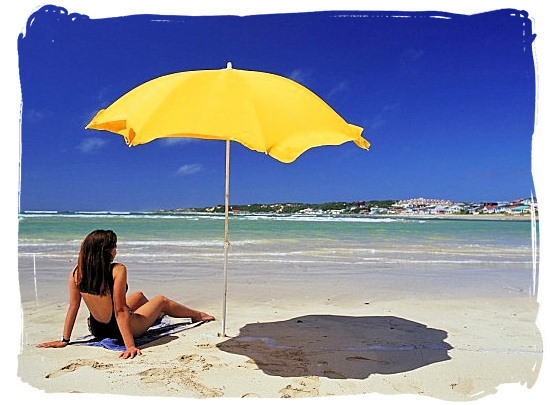 Beaches here include Scarborough, Kommetjie, Noordhoek, Hout Bay, Llandudno, Camps Bay, Clifton, Sea Point, Sunset Beach, Blaauwberg and many more. Most of them offer a wide variety of activities. The locals often prefer the Indian ocean side, where the beaches are wide and flat, which is ideal for family outings, swimming and surfing. They are manned by lifeguards. Beaches here include Boulders Beach and Windmill Beach, Simon’s Town’s Long Beach, Fish Hoek beach, St James tidal pool and beach and Strand and Muizenberg beaches amongst others. Exploring the beautiful countryside of the Cape Peninsula on a quad bike enables you to enjoy some of the finest unspoiled flora and fauna at close quarters, spurred by a touch of adrenalin for good measure. It is a new and exciting way of traversing the scenery of the peninsula whether it is in the form of a leisurely drive with the whole family, or a challenging adventure. 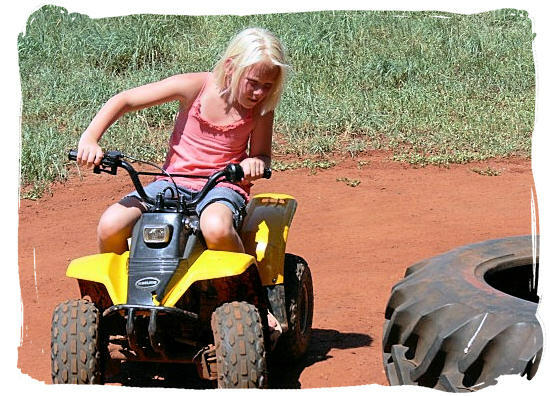 Traverse the beautiful Cape countryside on a quad bike with the whole family. 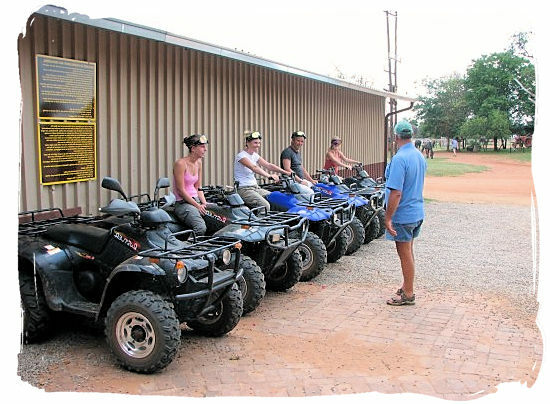 There some excellent quad bike tour operators in the Cape, catering for the youngster, the novice and the more experienced rider. Depending on your requirements, qualified guides are available to help you along with the handling of the bike and interesting educational talks and explanations along the route. A last round of instructions before taking off on a Quad Bike trip.